Machined from hardened steel to prevent bending or breaking while driving in any size roll pin. 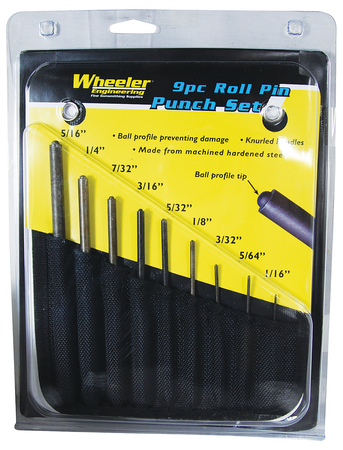 Punches have hemispherical tip to provide proper alignment of the roll pin to prevent damage to the firearm and the roll pin. Set includes (inch measurements) 5/16, 1/4, 7/32, 3/16, 5/32, 1/8, 3/32, 5/64 and 1/16 punches in fitted nylon storage pouch.